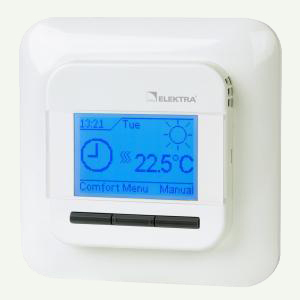 The Electronic 6-event Temperature Controller ELEKTRA OCD4 is designed for heating systems, especially for electric floor heating. Produced in accordance with EN 60730-1 and EN 60730-2-9. It consists of controller with built-in air sensor and floor sensor. Possible configuration of 3 temperature measurement methods through: air sensor, floor sensor or air and limitation floor sensor. Compatible with most of floor sensors in the market. New advanced Dot Matrix multilanguage display.